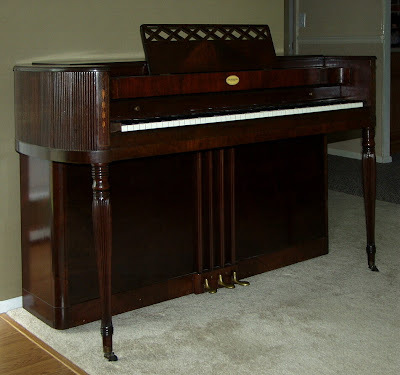 I am the owner of a "1946 Krakauer Spinet as pictured on you site. The piano is in perfect condition. I don't want to sell it, I am quite happy with it. It is really a beautiful piano with very good sound. I was curious as to the value. I can only tell you that it is not as valuable as you might think. As a used instrument, a Krakauer of this vintage and size is only of average value. You could consult a piano dealer in your area who is selling used consoles to get an idea of its value. As a piece of furniture, though, it would be worth more, to the right person. An antiques dealer might be able to advise you, but this would be a more speculative valuation. Your question is a common one, though, and it makes me think that posting about piano value might be a good idea. So thanks! Bill, I have this same piano and we are missing the little wheels on the two front legs. Any idea where I might be able to get those wheels? Not many of these Krakauer Bros. spinets were manufactured. Good examples can be of substantial value. However, the actual value can be highly speculative. Unlike many spinet and console pianos, the Krakauer Bros. were not mass produced and they generally used good quality materials. There were some practical aspects to the Krakauer Bros. spinet and console pianos. The bridges are only notched on one side, but the workmanship on the bridges is better than that of nearly all of the average brand pianos. Also, they often sounded better than the typical spinet or console. Too bad your father didn't spend the money to have the piano repaired properly. What a waste of a good quality piano. Yep, it was too bad. I saw one recently at a retirement facility. I have two Yamaha grands now so I can't say I miss those spinets too much.